There are many conservatives who argue that the unemployed need not be unemployed if they were only willing, perhaps with a cut in wages, to take one of the many jobs they assert are available. Help wanted signs are seen, and thus these conservatives believe the unemployed could get a job if they wished. They believe the unemployed are unemployed by their own choice, either out of laziness or due to an unwillingness to accept a lower wage. In terms economists would use, they believe that the markets for labor would always clear if only the workers were willing to accept a lower wage. The problem with this view is that it is not consistent with the fact that in economic downturns there are many more unemployed than job openings. Even if every single one of the job openings were immediately filled, there would be many unemployed workers seeking jobs still left. And since it in fact takes some time to fill any job, and since there is also constant turnover in jobs, one will see the help wanted signs posted for a while. Data for the US on this is now gathered by the Bureau of Labor Statistics of the US Department of Labor, in a monthly survey of private establishments (which includes non-profits) and government entities. The survey is a relatively recent one, having started only with data from December 2000, and gathers data on labor turnover (hirings, quits, firings, and other turnover) in addition to job openings (and is called JOLTS, for Job Openings and Labor Turnover Survey). The labor turnover side of these numbers was discussed in a post on this blog in January, which used the numbers to look at the dynamics of the job market. The post today will consider the job openings side of this survey. The graph above, based on the JOLTS data from the Bureau of Labor Statistics coupled with the BLS unemployment figures (from its separate monthly survey of households), shows the ratio of the reported number of job openings to the number of unemployed. 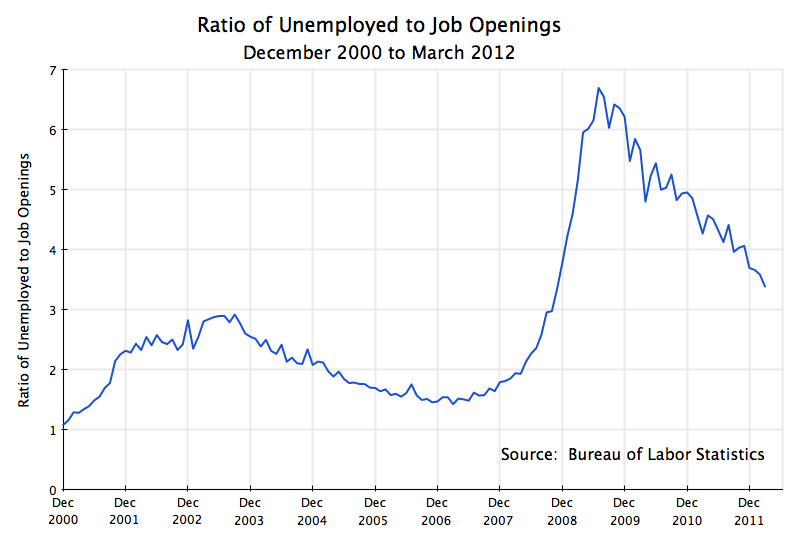 For the most recent month available, the ratio of the number of unemployed to the number of open jobs was 3.4. That is, there were 3.4 unemployed workers in the US for each open job that employers were seeking to fill. This ratio of 3.4 is significantly better than the approximately 6.5 ratio of unemployed to open jobs when unemployment was at its peak following the recent economic collapse. It is interesting to see in the graph the close to straight line downward trend since it hit that peak. But there are still many more unemployed than available jobs, and the labor market is healing only slowly. It still has a long ways to go. Note that when the economy is close to full employment (as in December 2000, at the end of the Clinton presidency, or in late 2006 / early 2007, at the peak of the housing bubble), the ratio is around 1.0 to 1.5. Note that there is no reason why the ratio necessarily has to be greater than one, as one could in principle have a situation of few unemployed and many open jobs seeking workers. But in practice, it appears that in the US the ratio will always be greater than one, even when the economy is at full employment. There will always be some unemployed and some unfilled jobs, and at full employment these are in rough balance. But the current ratio of 3.4 unemployed for every job opening, while better than the 6.5 ratio seen when unemployment was at is peek, is still well above the 1.0 to 1.5 ratio one sees when the economy is close to full employment. The unemployed cannot be blamed for being unemployed because they are lazy, or unwilling to accept a lower wage. They are unemployed because there are too few jobs out there. And there are too few jobs because there is not sufficient demand for the goods these workers could produce. As was discussed in postings on this blog on March 3 and on March 12, this insufficiency of demand in the aggregate for what American workers can produce is largely explained by fiscal drag, compounded (although of lesser importance in the aggregate) by the collapse of housing investment following the bursting of the bubble. Government (mostly at the state and local level) has cut back in this downturn. This is in contrast to the expansions of government spending and hence government demand seen in other downturns, and very notably in contrast to the strong expansion in government spending during the Reagan period (despite the myth). As the March 3 post estimated, if government spending (including state and local) during the Obama presidency had been allowed to expand by as much as it had during the Reagan presidency, the economy would now be at full employment. This entry was posted in Labor and tagged employment growth, jobs, unemployment by aneconomicsense. Bookmark the permalink.